Ergo Life Solutions offers a comprehensive range of customized Ergonomic and Wellness services including evaluation and training for any level of employee. For the employee who is experiencing discomfort. 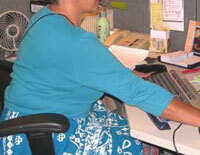 One-hour ergonomic training instructs employees about ergonomic risk factors, equipment, and prevention exercises. Employees are empowered to implement immediate changes to their workstations resulting in improved comfort. Workstation set-up and exercise materials provided. Workstation screenings to adjust current equipment for as many employees as able. Extensive written report with photographs and recommendations to implement safety measures. On-site evaluation of facility, including brief interviews with staff to determine needs and ergonomic risk factors associated with potential injury. One-hour session instructs employees about ergonomic risk factors, equipment, and prevention exercises. Employees are empowered to implement immediate changes to their workstations resulting in improved comfort. Report with written equipment recommendations for individual employees. Three-hour training targets administrative level staff to recognize obvious ergonomic risks, range of solutions and implement immediate changes for employees. Training includes learning how to screen employees for risk, selection of lowest-cost, appropriate ergonomic equipment, and strategies for equipment recommendations. Ergonomic equipment can be costly, especially when the wrong equipment is purchased or the employee does not know how to use it. 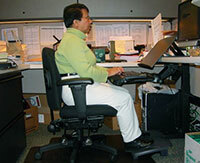 Assist with and guide the selection of cost-effective, appropriate ergonomic chairs and office equipment. Adjust and train employees in proper use of their current ergonomic equipment. Adjust and train employees in proper use of new ergonomic equipment. BEFORE: Shoulder & back pain AFTER: Brought keyboard & mouse close. Provided education.